Fantastically Great Women Who Changed the World Activity Book is an activity book with a difference. Along with mazes, colouring-in and puzzles, this activity book provides loads of easy to understand facts about some amazing women in history. Jane Austen, Rosa Parks, Amelia Earhart and more feature in this fun and educational book. The information is simple, interesting and short, so it doesn't dominate the pages. Plenty of space is left for amazing activities, and some of them are rather different to the ones you might be used to in an activity book. On the Jane Austen page, readers are invited to finish a story. On the Frida Kahlo page, readers are encouraged to draw their own art. On the Rosa Parks page, there’s space to design a poster. There are also mock postcards at the back of the book to cut out and give to friends and over 200 stickers of the amazing women who feature on the pages. It really does tick all the activity book boxes. PLUS the illustrations are amazing. Colourful, funky and fun, you’d be forgiven for not wanting your kids to scribble all over them. But you will, because it’s such an engaging and fun way to introduce children to amazing people who have done really amazing things. It’s an activity book that will encourage, inspire and spark dreams, something I doubt many activity books have the power to do. 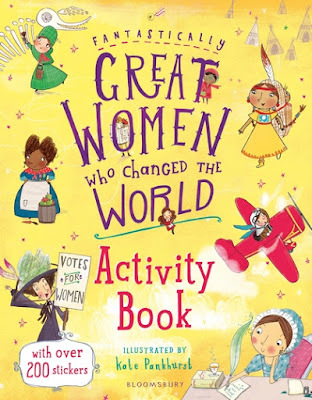 So, if you’re looking for an engaging activity book that isn’t the usual animals, rainbows or movie characters, Fantastically Great Women Who Changed the World Activity Book is the one you’re looking for. And if you and the kids would like to find out more about the fantastically great women in this book, there is a sister book that goes with it. Published in 2016, Fantastically Great Women who Changed the World is a fabulous non-fiction book for kids that provides detailed information about all the women featured in this activity book.